On the same night that they played their first UK show at a sold out O2 Arena, BTS (Bangtan Sonyeondan/ Beyond The Scene) won an AMA for Favourite Social Artist. It’s indicative to say the least: not only have they already established themselves as a supergroup in East Asia, but have now – through steady perseverance – become an international powerhouse. Hours before the concert starts thousands of fans are already gathered in front of the arena, speakers in hand blasting their favourite songs by the band. Many are singing along to the songs they know by heart; others pose with the giant murals promoting the event; and some are even faultlessly replicating BTS dance moves. It all feels like a big reunion, a feeling of camaraderie in the perceptible excitement: ethnicities, genders, ages and cultures clash and fuse together in the crowd. Fans from all over Europe have come to the show, and one word radiates from it all: positivity. For those who have a superficial, if any, grasp of who BTS are, the Korean band started back in 2013 from a small company called Big Hit. The group had a hard time coming to success, but – despite the hardships of all seven members (RM, J Hope, Suga, Jin, Jimin, Jungkook and V) – they have managed to push through and achieve what many K-POP groups before them only ever glimpsed: global recognition. From writing, producing and choreography, BTS have a hand in everything they do – far from the fabrication which often comes hand in hand with being a K-POP artist. The group does it all, and they do it to perfection. However, BTS’ secret goes far beyond their perseverance. Just look at their fandom, ARMY (Adorable Representative M.C. for Youth), whose dedication to the band has been spoken about probably as much as the band itself. It’s a dedication which can be attributed to the honesty BTS have poured in all of their work. Their three latest albums Love Yourself: Her, Tear and Answer deal with hardships from relationships, responsibility, and – through it all – learning to love yourself no matter what. Five minutes before the concert is meant to start, a voice from the speakers announces that one of the members, Jungkook, will have to sit down during the event as he was injured the previous night (this was not a surprise to ARMY, as it was trending the night before). Everyone in the arena screams Jungkook’s name in support. Finally, the two-hour long show starts with their latest song to hit the charts ‘Idol’. 20,000 people are singing as one voice: “You can’t stop me lovin’ myself”. This is what BTS advocate at all times, and remind their fans of at every chance they get. Indeed, at their UN speech, as part of their partnership with UNICEF’s new initiative, “Generation Unlimited”, leader Kim Nam Joon (RM) urged young people: “No matter who you are, where you’re from, your skin colour, your gender identity, just speak yourself”. This speech is just another step in BTS’ long history of speaking for, to, and about this new generation. During ‘Magic Shop’ – which Jungkook dedicates to the crowd – the lyrics – “At the end of my despair/ You’re the last reason/ For me who was standing at the edge of the cliff/ Live” – are brought to a whole new level of reality. Many in the crowd found in BTS a way out of their despair, while the group found in their fans a reason to strive for more. While the audience and the band shout back and forth, “I’ll show you”, during the chorus, the lines between fan and artist are blurred – it feels more like a promise made between great friends to go on no matter what, as long as they have each other. Throughout the concert each member gets their own performance. From the upbeat ‘Just Dance’ flawlessly executed by main dancer and rapper J Hope, to the darker ‘Singularity’ which is brought to life by the raspy soul voice of vocalist Kim Taehyung (V), all the way to the powerful ‘Epiphany’, where vocalist Jin earnestly promises to love himself despite all his flaws. Together, the solo tracks read as a story: one of many relationships, which fizzle out with time, and before long are faced with the decision to move on and choose oneself. But the group doesn’t only talk about relationships: in a medley during the middle of the show, they go from ‘Dope’, a maximal anthem for their hard work which infuses both EDM and hip-hop, to ‘Go Go’, a clubby jam representing exactly how our generation already “has a mortgage on our life”, and may as well spend our money, because, “YOLO”. ‘Airplane pt.2’, meanwhile, describes the double-edged sword of fame with breathy vocals atop lusty latin rhythms. 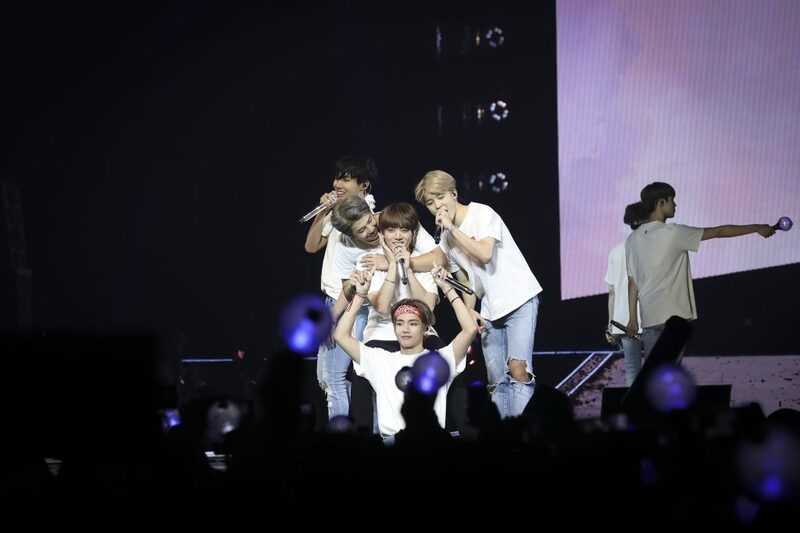 While many have taken the overly-travelled route of comparing BTS to One Direction, the groups’ main similarity is simply that they both have a large following. If anything, BTS’ performance echoes the faultless routines and choreographies of, say, a Beyoncé concert. The perfection of every step and complete fusion between the members and their backup dancers is impressive, even more so when you know that they have been doing this since the end of August with barely a week to rest – from Korea, to America and finally here in England. It is very common in Eastern Asian countries such as Korea to always strive for perfection, with many artists doing as many as six hours of training a day in the industry. However, even if the exhaustion is evident on the members’ faces when they are shown on the big screen, it all seems to wash away once they hear the screams of dedication shouted by thousands. ‘Answer: Love Myself’ commences. It’s the final song and, once again, dedicated to ARMY. Seemingly the entire audience sings: “You’ve shown me I have reasons I should love myself”. The secret to BTS is clear: for all the compassion, fun and constant support they show to each other and their work, they put just as much towards their fans. They are what these fans have been looking for; support, love, and someone to remind them daily that, no matter what, it will be okay. In this big, scary world they are not alone: ARMY and BTS stand as one force against the tide.